Registration for Spring 2014 is underway at the Pratt Institute, and I am offering two Sustainability courses. Each of these courses may count as a Social Science or Philosophy elective, each may count to satisfy credits in the Sustainability Studies minor, and there are no prerequisites for either of them. All Pratt undergraduates are eligible and encouraged to enroll. Both of these courses may count as a Social Science or Philosophy elective, and there are no prerequisites for either of them. As of Monday morning, SUST 401 has 1 space left, so students interested in taking it are encouraged to register now. If you are a Pratt student and have any questions for me about these courses (or about the Sustainability Studies minor), please feel free to contact me at czimring@pratt.edu. This entry was posted in consumption, recycling, students, teaching, waste on November 17, 2013 by Carl Zimring. We met Chloe in 2004. 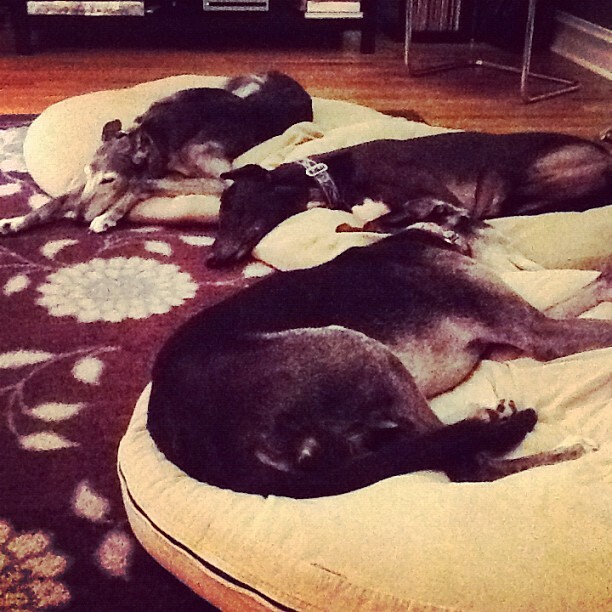 She was the first greyhound we lived with, and was such a nice dog that we adopted two more within three years. But she was the first. 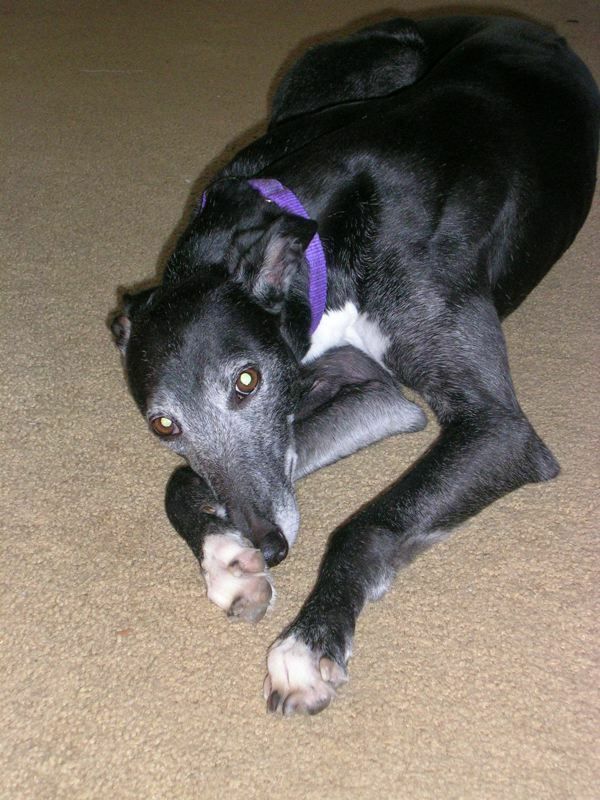 She was five when we met her, and was already retired from a career racing in Florida. A salvage dog, living with a recycling historian. This is her sitting obediently waiting for a salmon treat that first year. 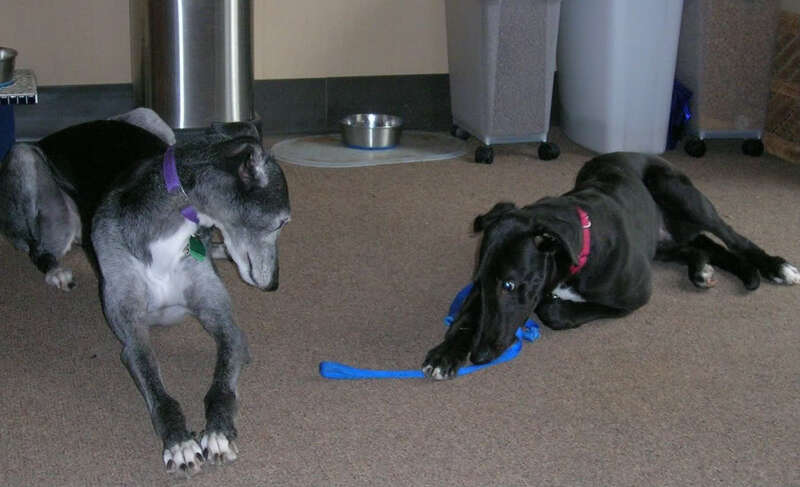 Chloe taught us all about greyhounds. She taught us how they run amazingly fast for a couple of minutes and then spend the rest of the day lying inert. She taught us how they groom like cats do, eat ravenously, and pick up weird neuroses such as being afraid of the closet where The Monster (what we humans know as the vacuum) lay in wait for her. She taught us about the dental and medical issues these dogs can have, with some of the worst teeth this side of Shane MacGowan and a variety of reasons to visit veterinary offices. When she was seven years old, in December of 2006, she started taking on fluid in her midsection. The vets said that her intestines were malfunctioning, maybe due to a virus, maybe due to cancer. We thought we would have to put her down by New Year’s. Some medication later, and the liquids in her abdomen resolved themselves, but she was very weak. She could not sit up or walk for three weeks. Mostly she lay with her head on the ground and we had to hand-feed her. She recovered. Fully. Maybe better than before. Got a little whiter, especially in the face. When our local rescue group got a puppy named Hudson, we took him in and she was quite happy to hang out with him. In the years since, she had cancer a couple of times, but localized in the leg. The worst effects of those tumors were having to wear bandages after surgery. Chloe moved with us from Ohio to Illinois and then to Brooklyn. (Here in Brooklyn, I used to joke to passersby that she got it backwards, working in Florida and then retiring to New York.) 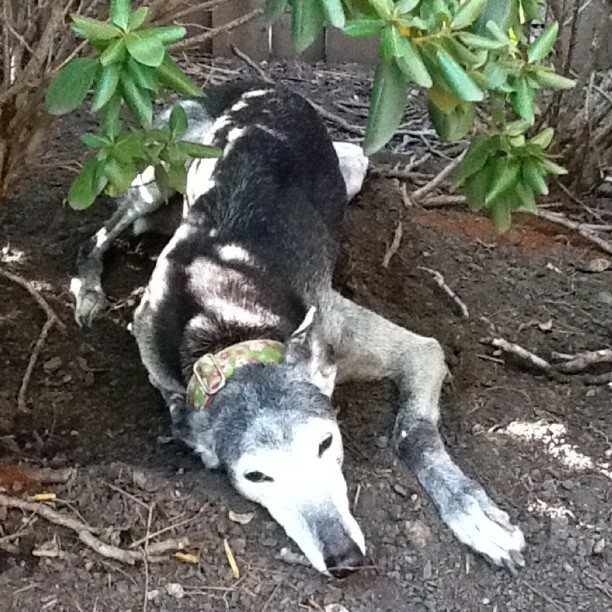 Wherever we were, she always tried to dig a little hole and laze around in the dirt. 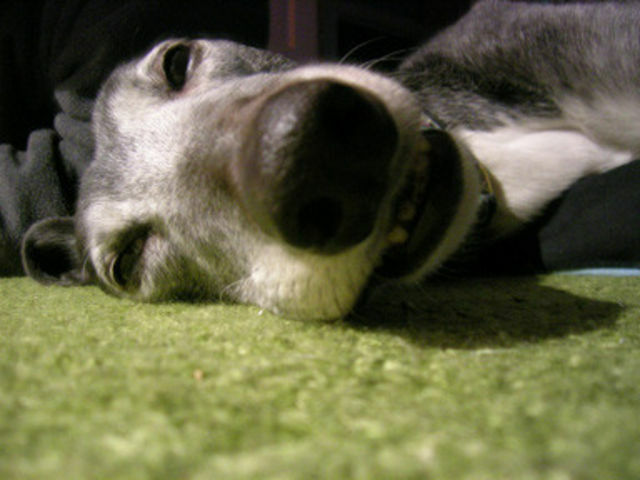 Greyhounds tend to live from 12 to 14, though several illnesses kill them younger. 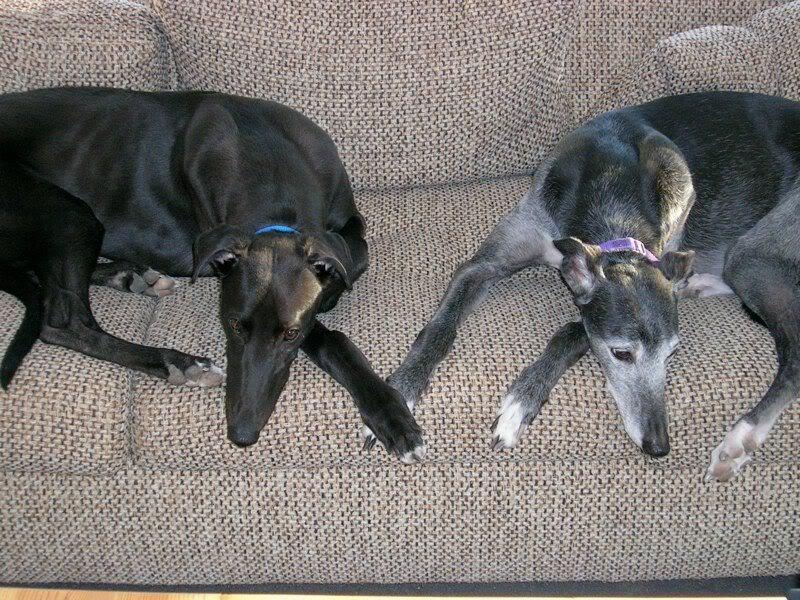 Her half-brother Huey (they share a sire, along with 8,300 other dogs) died a month shy of his eleventh birthday from cancer. They spent several years together (mostly asleep) hanging out with Hudson. Chloe turned 14 last April. She got frail in her old age, but doubled her age since we nearly lost her in 2006, seven years ago. None of that time was taken for granted. Last night before I went to bed, I thanked her for sticking around for my birthday. Today, that day, she got up, had breakfast, took a walk, had lunch, spent some time getting love from people walking by the yard, and then got in her bed. Late in the afternoon, she moved to get up and snapped her back leg. The decision was easy, and we said goodbye to her just about the time she’d usually have her dinner. The last taste in her mouth was a farewell brownie hurriedly purchased from the market around the corner from the emergency vet. 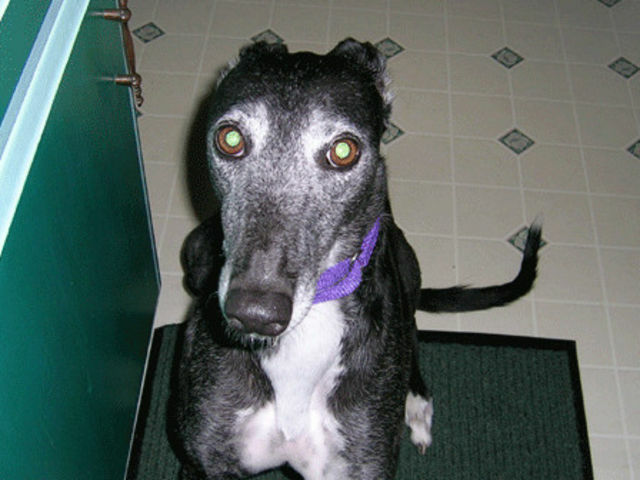 Saying goodbye to Chloe is sad, but we are grateful for the time she spent with us, and for teaching us about life with greyhounds. 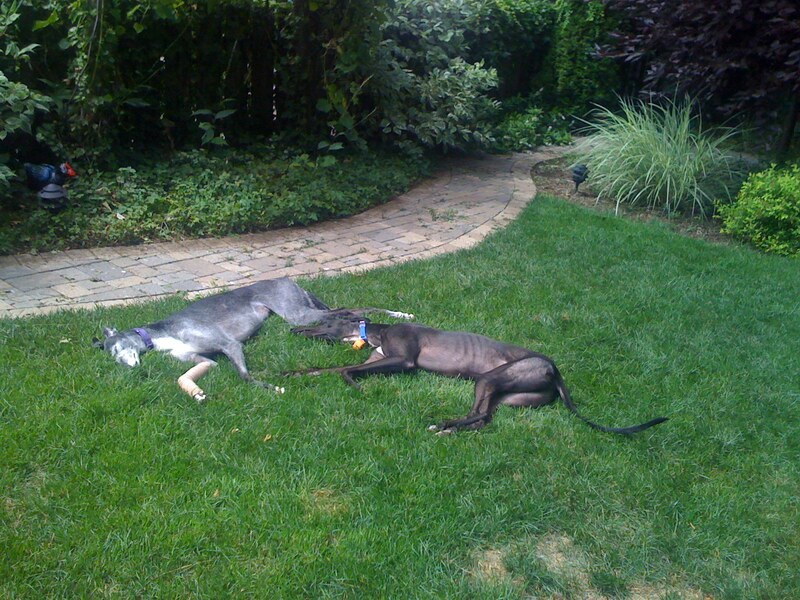 If you are curious about greyhound rescue, I encourage you to talk to your local rescue group about sharing your life with one of these wonderful creatures. Thank you, Chloe, and goodbye. This entry was posted in Uncategorized on November 16, 2013 by Carl Zimring. When you drop your Diet Coke can or yesterday’s newspaper in the recycling bin, where does it go? Probably halfway around the world, to people and places that clean up what you don’t want and turn it into something you can’t wait to buy. 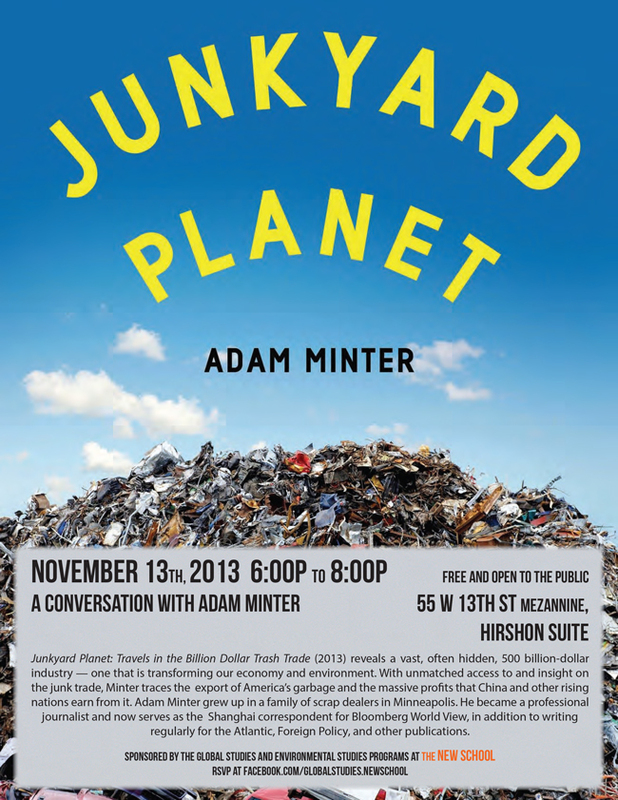 In this discussion, veteran journalist and author of Junkyard Planet: Travels in the Billion Dollar Trash Trade (2013), Adam Minter, travels deeply into a vast, often hidden, 500 billion-dollar industry — one that employs more people than any other industry on the planet except agriculture, and that is transforming our economy and environment. Minter takes us from back-alley Chinese computer recycling operations to recycling factories capable of processing a jumbo jet’s worth of trash every day. Along the way, we meet an international cast of characters who have figured out how to squeeze Silicon Valley-scale fortunes from what we all throw away: Leonard Fritz, a young boy “grubbing” in Detroit’s city dumps in the 1930s; Johnson Zeng, a former plastics engineer roaming America in search of scrap; and Homer Lai, an unassuming barber turned scrap titan in Qingyuan, China. With unmatched access to and insight on the junk trade, Minter traces the export of America’s garbage and the massive profits that China and other rising nations earn from it. Minter explains that if what you toss into your recycling bin can be used in some way, the international scrap recycling business will manage to deliver it to the person or company who can do so most profitably. “Going green” usually means making money—and it’s often the most sustainable choice, even when the recycling methods aren’t pretty. The lecture and presentation will be followed by a Q&A, book signing and reception. Adam Minter grew up in a family of scrap dealers in Minneapolis. He became a professional journalist and now serves as the Shanghai correspondent for Bloomberg World View, in addition to writing regularly for the Atlantic, Foreign Policy, and other publications. For the last decade, he has divided his time between the United States and China. 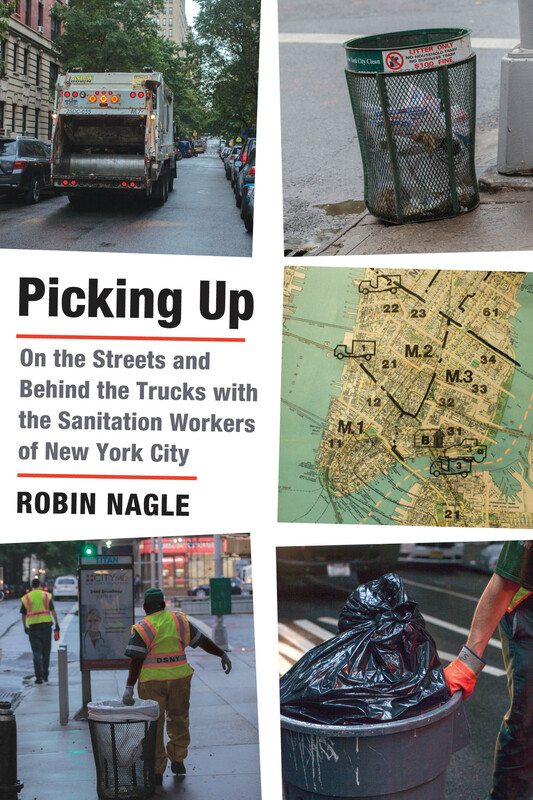 Thursday, CUNY hosts Robin Nagle, Mierle Laderman Ulekes, and Sanitation Commissioner John Dougherty. This entry was posted in events, recycling, waste on November 10, 2013 by Carl Zimring. 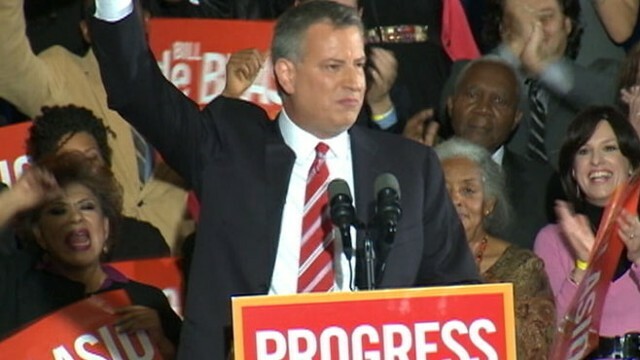 New York City Public Advocate Bill de Blasio won a landslide victory to become the next mayor. In his campaign, Mayor-elect de Blasio ran on a platform of reducing inequality and enhancing sustainability in the city. As the transition from Mayor Bloomberg to Mayor-elect de Blasio officially begins, remembering this platform will be useful in evaluating the future direction of the city. Here, in full, is the candidate’s platform on sustainability (as found on his campaign website). Several of these promises reflect continuities with the Bloomberg administration. Some are departures. A few raise questions about the details of implementation. This is an ambitious platform, and sustainability advocates are curious to see how and how much of it becomes policy for the United States’ largest city under Mayor de Blasio over the next four years. This entry was posted in policy, recycling, sustainability, waste on November 6, 2013 by Carl Zimring.